Today Sotheby’s International Realty WHO DESIGNED YOUR HOME? Lawrence Cheung About five years ago, my parents gave me an opportunity to design my first ground-up house. I was very fortunate to take on this project, because it was a learning experience. All of my years of working in an architectural office in the east coast and as a project manager for my father’s construction company were put to the test. A former client and family friend was also interested in being a part of this project and played a major role in the design process. We exchanged many ideas with one another throughout construction. It was truly a collaborative effort. todaySIR WHAT IS THE HISTORY OF YOUR HOME? LC The house was built in 2013, just a little over a year ago. It is a Spanish Colonial-inspired house from the exterior; very traditional and modest. 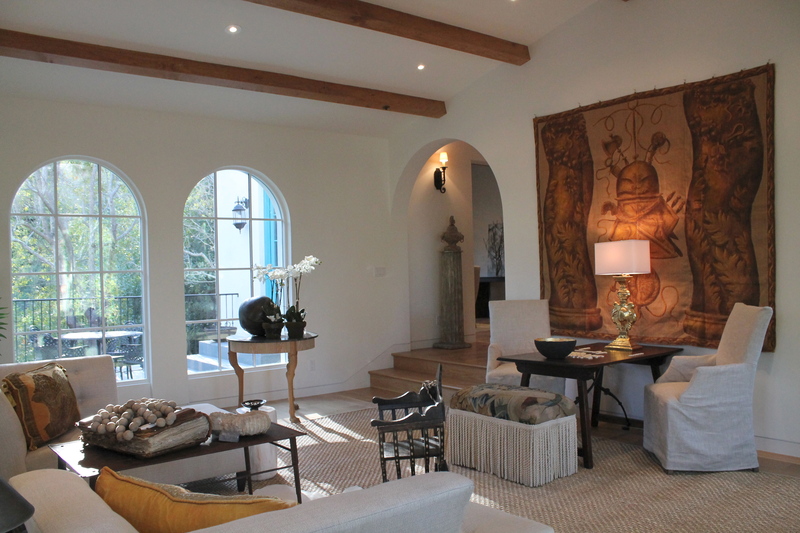 We wanted to stay true to the architectural style- low-pitched mission clay tile roof, exposed wood rafter tails, thick white-washed stucco walls with recessed-in French patio doors and casement windows. The interiors are more subdued with a simple and elegant material palette of white walls, timber beams, wide plank white oak floors and pale travertine. The house needed to blend in with its surrounding of native California live oaks. We even planted a stunning oak tree out by the cobblestone-paved courtyard to look as if the house was built around it. I always pictured it as an old country villa that was completely revamped with all the modern amenities and conveniences of a boutique hotel. todaySIR WHAT DO YOU LOVE ABOUT IT? LC Many people, who have visited the house, often said they love how everything is so open and spacious with an abundance of natural light. I spent months designing the floor plan, elevations and interior sections, simultaneously going back and forth and envisioning how might a family or a couple will want to live in this house. 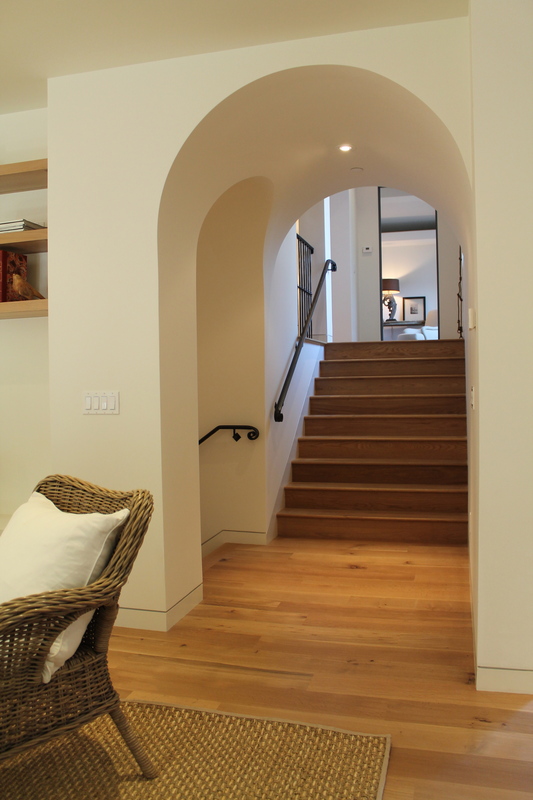 I wanted to create an open plan that provided people a way of orienting themselves throughout the house and yet feel cozy in the more intimate public areas, such as the pantry and laptop station in the kitchen and the space beneath the main staircase. One of my design methodologies is to prescribe a sense of order and proportion throughout the house; making sense of every line that is drawn and visualizing that in a three dimensional space. This is called a horizontal datum. 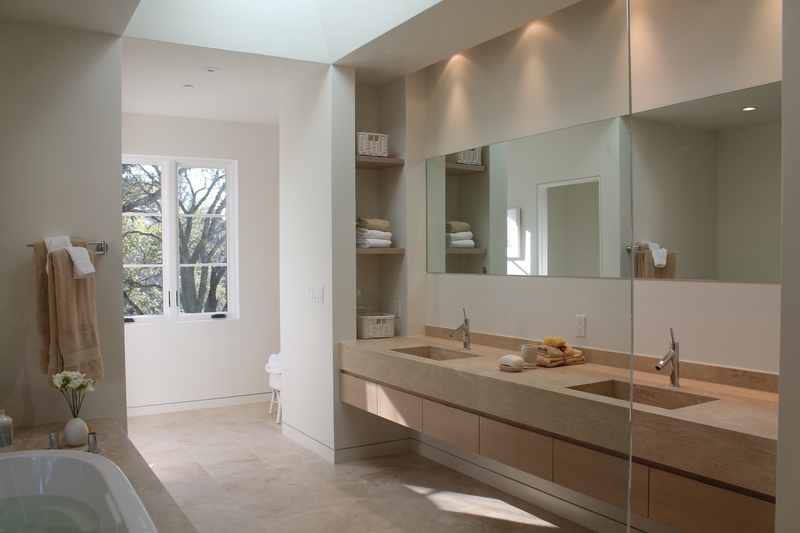 For example, the drop ceiling in the family room lines up with the underside of the kitchen soffit; the edges of the master bath skylight meet up with the corners of the walls supporting the floating vanity; the top of the entertainment unit becomes the top of the floating stone bench in the family room. Your eyes become drawn to these visual connections as you walk from one space to the next and everything seems to make sense. Because it is a minimalist house, these visual connections are more apparent than in your average home. 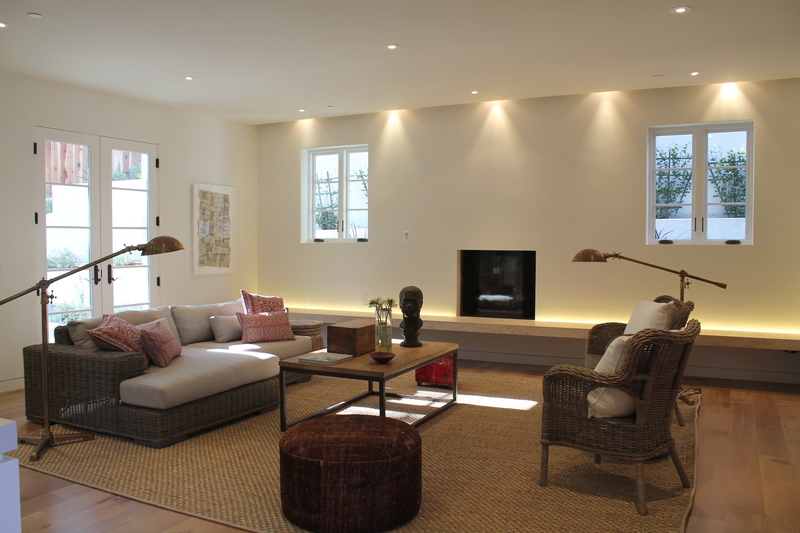 Designing and building a bespoke minimalist home (or building) is without a doubt very challenging, because everything has to be so precise, and there are no crown moldings, baseboards, and other architectural wood work to cover the joints between walls and ceilings and floors. todaySIR WHY DID YOU BUY IT OR BUILD IT? LC During the schematic design phase, I remember my parents suggesting that perhaps the bathrooms could be a bit more contemporary. Naturally, I took that as an invitation to design a traditional house that has both an Old World charm and a minimalist aesthetic. I was interested in tapping into the high-end real estate market. Many wealthy foreigners and young entrepreneurs with growing diversified stock portfolios are either building their own dream homes or in search of one that is unique with style. Around this time, I was reading about hotelier and real estate developer Ian Schrager, who gained fame as co-owner and and co-founder of Studio 54 in New York City. I admired his concept of introducing the boutique “hotel as lifestyle” in his residential and mixed use projects such as 40 Bond Street and 50 Gramercy Park North. This idea inspired me to treat this house as something that is one of a kind. todaySIR WHAT WILL YOU MISS ABOUT IT? LC We spent almost a year and a half building this home so there were quite a few lasting memories. One of my favorites was observing how the morning sun light comes through the stairway window by the barrel vaulted staircase. It is very ethereal. todaySIR WHAT WILL YOU REMEMBER? todaySIR WHAT IS THE MOST BEAUTIFUL THING ABOUT YOUR HOME? LC The exterior has a very timeless quality about it. Timelessness is very important to me, because an object or building should withstand time and not be labeled as something “trendy”. That is why most people can identify with traditional homes. Whether it is a Shingle Style or Georgian colonial, a beautiful house is well-proportioned and historically accurate. After I graduated from Woodbury University, I took a trip to Europe and marveled at the magnificent cathedrals and beautiful monasteries. I came back with a greater appreciation for the generations of master builders and craftsmen who spent their entire lifetime building these glorious monuments. I was fascinated by their traditional building methods and so I began borrowing their ideas to get a better understanding on why we are so drawn to vernacular architecture. As a minimalist, I have a deep found respect for tradition and a desire to create minimal spaces that compliment both clean, contemporary lines with old-world touches. I am spiritually drawn to the monastic aesthetic, celebrating solidity and mass while using a minimal palette of natural materials set against a backdrop of plastered white walls. I like the purity of white, because it is essentially a blank canvas to work off from. It brings clarity to a space and provides a nice juxtaposition to the colorful landscape vistas in the background. The views from the windows become the art itself. When one enters this home, one can see the Spanish Colonial influences- the timber beams, the thick walls, the wrought iron railing, etc. but that is the extent of it. Beyond that, Roman travertine wash basins and limestone floors, wide-plank oak hardwood flooring (with knots and blemishes), and pale rift white oak cabinetry reveal something that looks more revamped farmhouse/ monastery than hacienda. 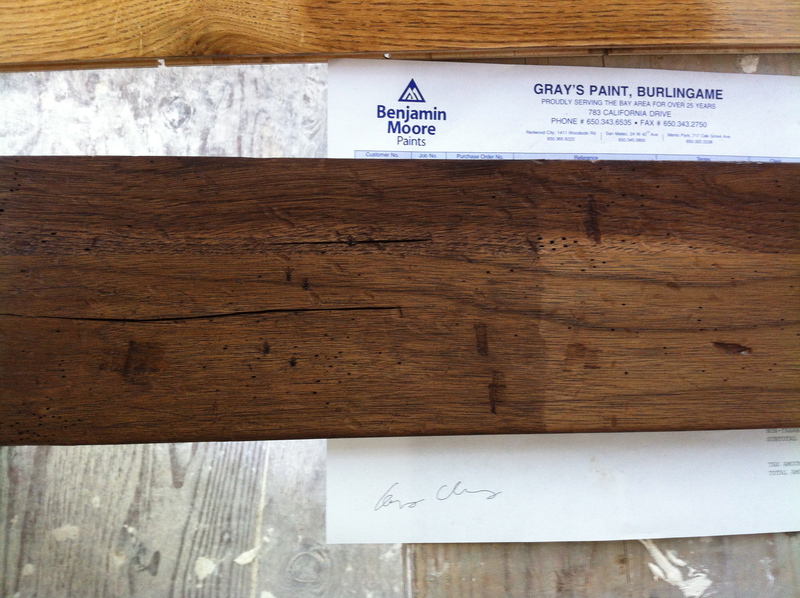 Even the beams and rafter tails were lightly stained to bring out the natural color of the wood as opposed to the typical dark brown wooden features that we see in many Spanish Colonials. todaySIR WHICH ROOM IS YOUR FAVORITE? LC The kitchen and family room are my two favorite rooms. Technically, it is one large open space. It is the corner of the building where the two wings intersect. 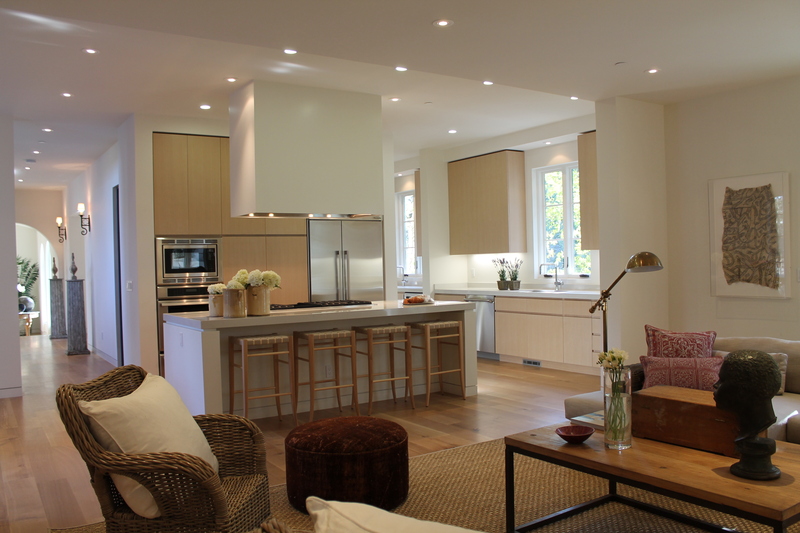 It is the place where guests come to hang out by the kitchen island while the hosts prepare them with cocktails and appetizers. Definitely the perfect spot for hosting a Super Bowl party or watching the Oscars. 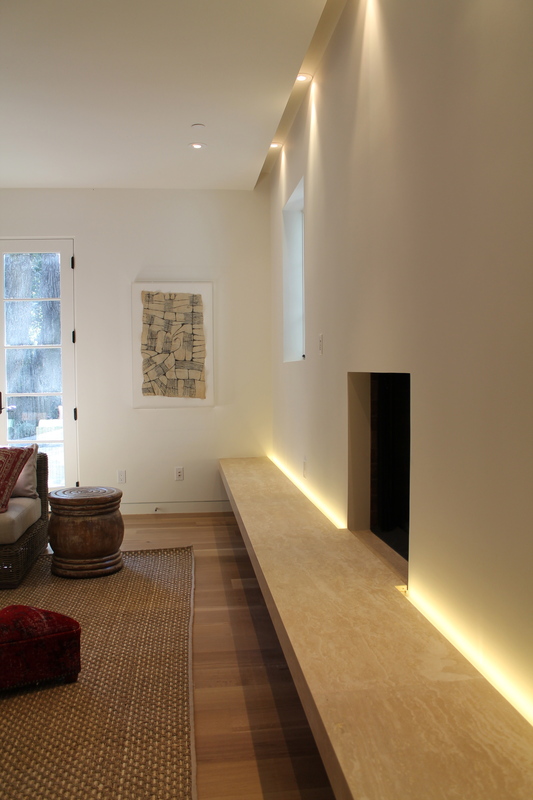 Many people have also commented how they love the LED uplighting behind the 21′ long cantilevered stone bench. It gives the dramatic appearance of weightlessness, as if the stone bench is floating. todaySIR WHAT LITTLE DETAILS DO YOU TREASURE? LC Early on, we thought that this house would need to make a statement as soon as you walk up to the front door. 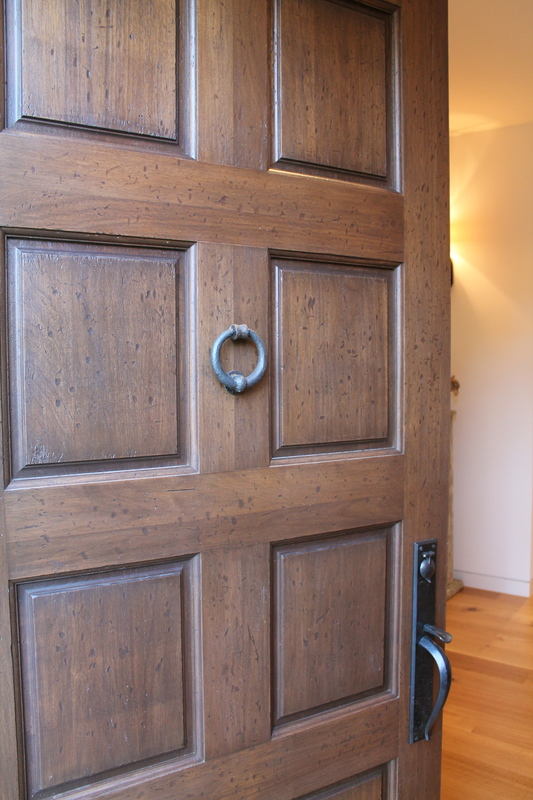 The door is the first thing you touch so we thought it would be extraordinary to give this brand-new piece of walnut that aged, weathered look. My client instructed me on the multi-step process, which he learned from the artisans who had worked on his own front door. 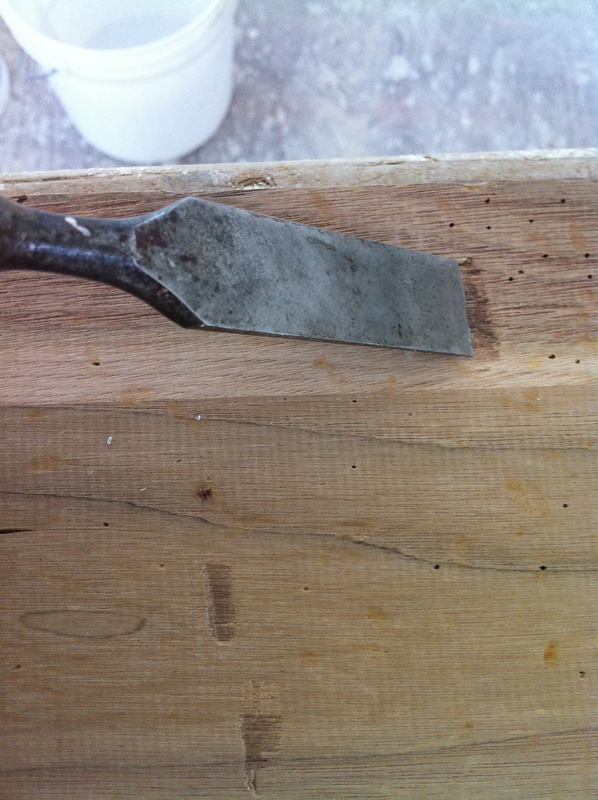 First, we had to bleach it three times; next, we gave it a subtle wire brushing to open up the grain and soften the corners and edges; I used a utility knife and chisel to score deep grooves and chamfer the edges to resemble cracks. I found an old chain on the job site and used it to beat the surface so that it was covered with little indentations. I drilled a couple of screws through the end of a wooden stick and bludgeoned the door to make it look like it was riddled with a thousand worm holes. Afterwards, I applied a very dark stain so that it seeped into the wood grain, and then I quickly wiped the surface so that only the stain remained in the grooves. Finally, I put on three different coats of a lighter stain so that the darker stain came through to give the wood depth and richness. Some people told me that they had thought it was a salvaged antique door that we picked up somewhere. 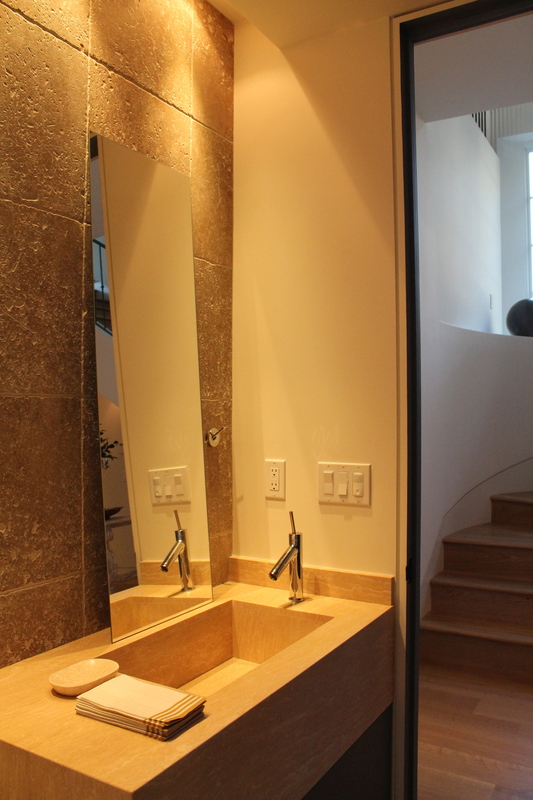 I also want to mention about the integrated stone wash basins in the powder room and the master bath room. 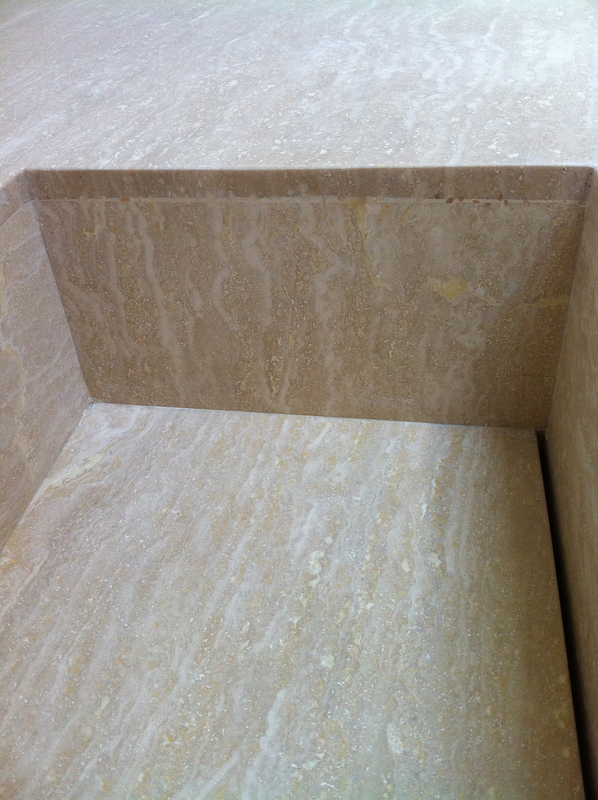 We were fortunate enough to find eight slabs of vein cut Roman travertine all the way down from Southern California. This natural material has beautiful veining (or streaks) across the surface and it is harder than limestone, but softer than marble or granite. I instructed our stone fabricator to miter the 9″ thick edges of the stone with all the veining in one direction and no seams so that it looks like one monolithic piece. 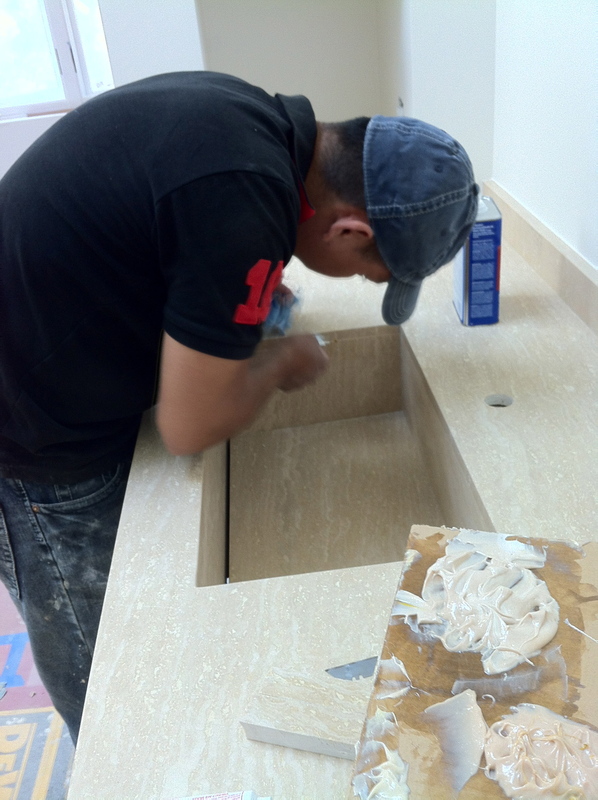 The inside of the wash basin is comprised of 3/4″ thick slabs that are epoxied together to form a box. There is a narrow slit on one side of the basin for the water to drain in. We also decided to have flush baseboards (or recessed baseboards) throughout the house to bring the wall surface to its simplest form. 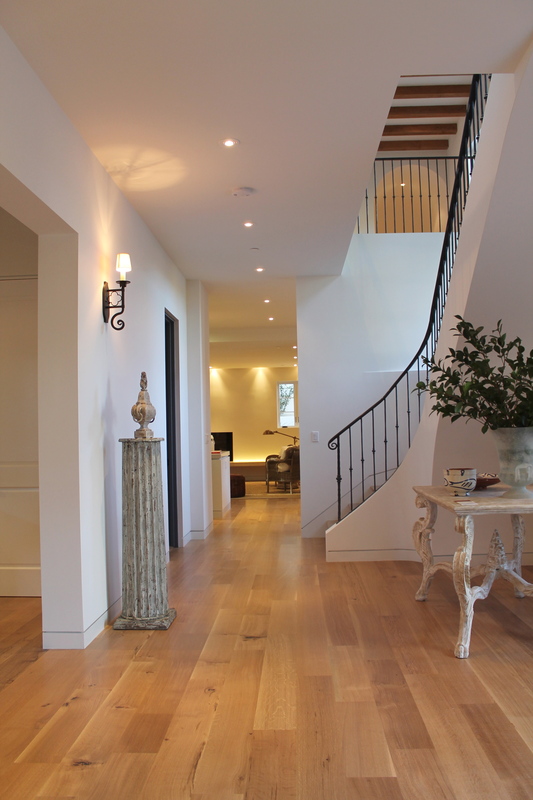 If we applied baseboards over the wall surface, the vertical wall plane becomes staggered. It was very challenging to build, because the floors needed to be dead level and all the walls had to be plumb and straight. From a practical standpoint, you end up not having to clean the dust off the top of the baseboards. LC The bright turquoise windows shocked some people at first but the color eventually grew on them. todaySIR WHY IS THIS A GOOD PLACE TO LIVE? LC The property is located in one of the sought after neighborhoods in Hillsborough and only minutes away from South Hillsborough elementary school. It is less than a five minute drive to downtown San Mateo and about fifteen minutes to San Francisco International Airport. The hillside property is surrounded by native oak trees with a brand new home that is ideal for entertaining. This 5,800 square foot home boasts ten foot high ceilings with museum-like spaces and dramatic lighting for the art-savvy collector. 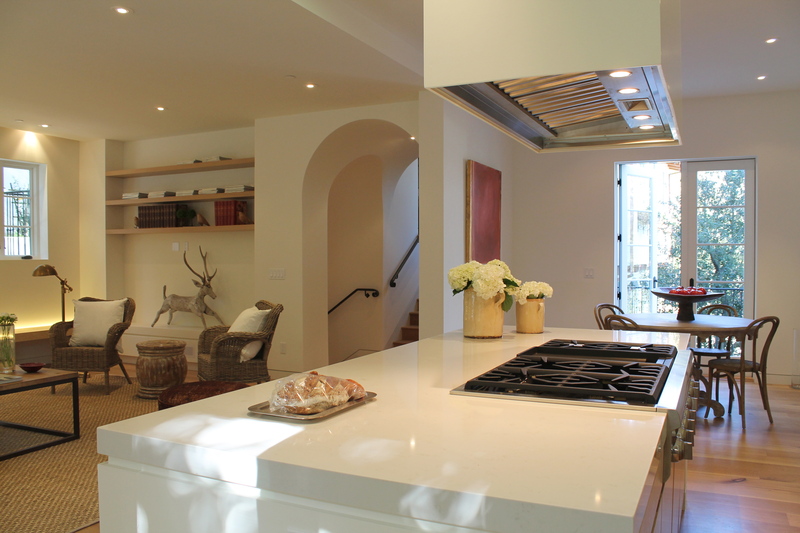 A spacious kitchen with up-to-date Thermador appliances and a spa-like master bath with Hansgrohe Axor Starck fixtures are some of the unique features that this house has to offer. THIS BLOG claims no credit for any images posted on this site unless otherwise noted. Images on this blog are copyright to its respectful owners. In the event that there is still a problem or error with copyrighted material, the break of the copyright is unintentional and noncommercial. If there is an image appearing on this blog that belongs to you and do not wish for it appear on this site, please E-mail with a link to said image and it will be promptly removed.